An elderly woman walked into the local country church. The friendly usher greeted her at the door and helped her up the flight of steps, 'Where would you like to sit?' he asked politely. 'The front row please,' she answered. ‘Do you happen to know who I am?' the woman inquired. 'I'm the pastor's mother,' she replied indignantly. A kindergarten teacher gave her class a 'show and tell' assignment. Each student was instructed to bring in an object to share with the class that represented their religion. Monday! That's when we are heading for Greece. I'm SO excited!! Can't wait to see the friends there. Can't wait to get my little house dusted and set up. To sit in our little balcony and watch the city go by. To hug Thomai, our downstairs neighbor. My TO DO list is too long to fit on one page. Time for blogging will be very short this week. After that, I expect I'll spend a couple of days getting over jet lag. But THEN, I'll be posting this year's installment of my adventures abroad. Plus some of the usual topics. We'll be leaving Greece June 28, for 10 days in England, house-hunting before we come home. That is, looking for a small apartment. At the very least, even if we do not succeed in acquiring one, I'll get a very different view of England. "From the inside" will take on a different meaning, won't it? For the next few days, I will be kept busy and happy by my children and grandchildren. I'm doing a farewell visit before heading off to Greece and England for the next 3 months. I am bringing my laptop, but don't know how much blogging I'll be able to do. So the Quiz is still waiting for answers from YOU. Yup, it's hard to talk about, Mystery on the one hand, which is beyond words, and nonsense on the other hand... Still, you're invited to give it a whirl. Save me some work! In discussions of God, Church, theology, salvation, and the like, what's the difference between what is genuine Mystery, far beyond the limits where human reason can reach, and pure nonsense? Do you know how to tell the difference? It's important to be able to discern that difference. Because if we don't, we could believe any nonsensical interpretation of Scripture anyone proposes. We could fall for anything. No matter how plain your face may be, no matter even how ugly, if it reflects your inner joy, everybody will be glad to see that face. If it is suffused with humility, people will be charmed by your face. If it is a face full of love, it will be transfigured into a thing of radiant beauty. This is neither some metaphor nor some merely sentimental thought, but sober reality. In fact, if we see the face of a saint, we literally can no longer tell whether it is beautiful or ugly in the secular sense. That category simply no longer applies. All we know is, it's one of our very favorite faces in the whole world. We bow down before Your Cross, O Master,and we glorify Your holy Resurrection. Today the Cross is carried in solemn procession, as Christ draws near to His voluntary death; and we follow Him to our own voluntary death before involuntary death overtakes us. That is, we crucify the selves we were born, to emerge as true members of Christ. We refuse to indulge, and we repudiate, our greed, selfishness, jealousies, lusts, pride, and all our other passions, that we may live a whole new order of Life, both here and in the ages to come. The way of the Cross becomes the way of Life. No longer does the flaming sword guard the gate of Eden, for a glorious extinction has come upon it, the wood of the Cross. The sting has been drawn from death and the victory from Hades. And Thou, my Saviour, didst come and shout to those in Hades: Enter Paradise again. "If anyone will be My disciple, let him take up his cross, and deny himself, and follow Me." The saying is that you must walk a mile in your brother's shoes before you criticize him. This saying is totally inadequate. First, you can't just walk a mile and be qualified to judge your brother. It has to be a particular mile: the very same one he walked. And in the same weather, too. Second, you don't have access to his shoes. Third, you don't have access to his feet. His shoes may fit you very well, but you don't know how much they may hurt his feet. You have no idea whether you could walk twenty paces along that route, with those shoes, on those feet. Matthew Gallatin's latest 3 podcasts are up on Ancient Faith Radio, on why the Ninth Chapter of the Epistle to the Romans is not about predestination, single or double. One of my favorites of his observations is that a loving relationship is definitely not one in which one party manipulates or controls the other. 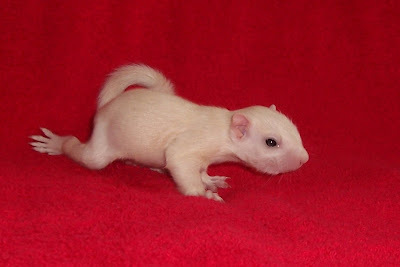 On February 12, I posted a picture of some brand new baby squirrels, literally only about 2-3 days old, and pointed out that one of them would probably be a white squirrel once his fur came in. Well, he is furred now, and yes, he is white. Here are some pictures of the baby, now about 6 weeks old. 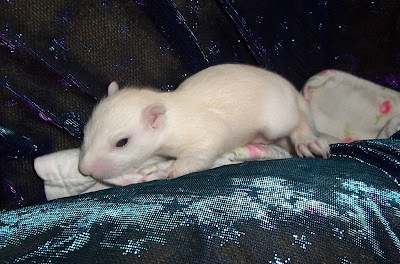 He is not albino; albinos have red eyes and this little baby has brown ones. He's just white. What fun! Clicking on any of these pictures will enlarge it to approximately full-screen size. 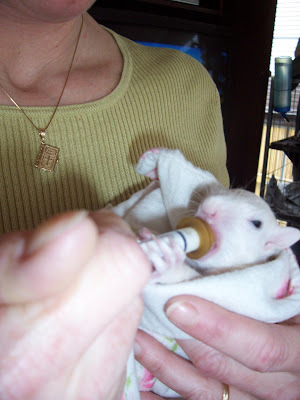 Whitey Squirrel Holds His Bottle. I'm Assuming That's Holly Holding Him. Our closest friends Matthew and Esther have been mentioned on this blog many times. They farm in southern Missouri. Yesterday their youngest child, Fergus, suffered an accident in which he nearly drowned at their home. He did not breathe for a considerable time. He was brought by helicopter to a hospital. He is on a breathing machine, and is being kept cold in order to reduce brain swelling. The doctors told his parents that they will not know the extent of brain health until 48 to 72 hours after the accident. It has been less than 24 hours as of this writing, and at this point Fergus is not doing well. Fergus' first birthday is later this month. The pain of this event is compounded by the fact that Matt & Esther lost a 2 month old daughter to SIDS in 2006. If you could remember them in your prayers, dear reader, I should be most grateful. Holy Father St. Patrick, healer and wonder-worker, pray to Christ our God for His servant, the infant Fergus! UPDATE: (March 23) Fergus is not doing well. He is unresponsive, we are told. Things look bleak. and through him didst guide many to the true Faith. Most Compassionate One, glory to Thee. Here is my favorite story about St. Patrick, along with a small excerpt of the famous hymn he wrote. Sometimes in Orthodox services (ideally, always, but it isn't always so obvious), this miraculous something happens, in which the people are aware of being all one. I do not mean one in values or emotions or purpose or ethnic identity, even when all those are also true; I mean we become aware of living but a single Life. There is the one Life and we're all living it, all living that same Life, together. That happened today at Ero's funeral. Hundreds of people came, and hundreds of people wept, and nobody was there from any such feeling as, "I really ought to go." And everyone else's sorrow was my own, and my sorrow was theirs, and we all understood this, saw it in one another's eyes. And about halfway through the service, I figured out something else: Ero wasn't just Daphne's mother, not just Olga and Mary and Trish's mother; she was everybody's mother. Yes, she was. In her quiet, unobtrusive, behind-the-scenes way, she lavished a mother's love upon one and all. She was a peacemaker. If you had offended anyone, she would go to that person and ask him or her to invite you out, or would ask that person to show you pictures of his latest trip to Greece, or -- or whatever. She always had some practical way of making up that she knew would work. And you'd do what she asked. Not for her, but because she would change your heart to make you want to do it. 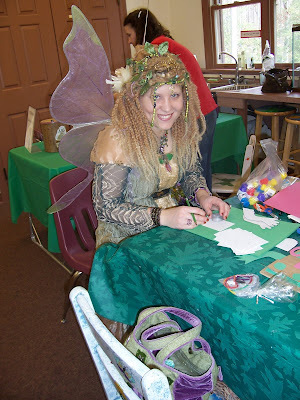 She saved those little postcards we all used to get in the mail about missing children. She saved them and prayed for each missing child individually, by name, every day, and then for all missing children everywhere, and for their parents. She made a huge mark in this world, and one marvel is how she did it. She wasn't educated. She wasn't an elected official; as far as I know she never headed up any church organization or even any committee. She wasn't any sort of dignitary. She wasn't rich. She didn't have an illustrious career or any of what this world would call "accomplishments". She wasn't a head of state, wasn't thrown to any lions, didn't evangelize a country or write a book or star in a movie. So how did she manage to change so many people for the better? How did she manage to leave so large a legacy and one so much more important and lasting than that of any celebrity? Simply by her love and her humility. By being Christ-like. By being extraordinarily good. If you want to leave your mark on the world, this is all you need. Matthew told me that on Thursday night, her suffering had become so difficult that he prayed, "Jesus, please take her now!" Then he went into her room, scooped her up in his arms, and said, "Baby, I love you so much." She opened her eyes, looked at him and then at the ceiling, and died. In his arms. Those were the words she wanted to hear; those words were all she needed to make her feel her life had been a successful one. I wasn't going to go to the cemetery. It's a cold, dark, damp day and I thought I'd rather help in the church kitchen getting the meal ready. But then it seemed I ought not leave Demetrios alone, to go by himself, who was also pretty shaken. And it seemed that to see her body to her actual grave was one last small service I might render Ero. "Not that she cares," I added, to Demetrios. But she does, he assured me. She will still treasure every token of love, and God will count it, too. And that's when the peace descended upon my soul at last, when I realized he was right; it is not too late to be of service to Ero. There's still her family, and the best thing one could ever do for her was always to be good to her family. That's without doubt still the case. One can still take very good care of her family. Pray for me, that for Ero's sake, I shall not fail in this, at least. 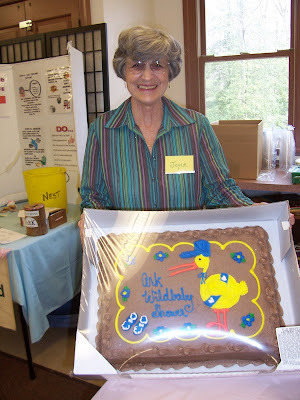 Today in church we had Barbara's one-year memorial, a little late since I had planned to have it last week, but of course we don't do memorials on the Sunday of Orthodoxy; that would be a little like having a funeral on Christmas. Our very close friends, Nick and Sharyn, also had a memorial for his nephew, Elias ("Louie"), killed recently in a hit-and-run incident in Florida. Sharyn was quite broken up over it. Then we all went out for a meal at a restaurant owned by a relative by marriage(s) of Nick and Sharyn's. Maria came with us, and told me she had just lost her Aunt Rita, who had been a favorite of mine for many years. I knew her from where I lived before I moved to Richmond. When I first began attending a Greek church there, with no intention whatever of actually becoming Orthodox, she took me under wing. She stood next to me in the choir. After the meal, it was time to stop by the funeral home to hug and kiss Ero's family. Ero's body was not at all well fixed up. All the sweetness was gone from her face, and it even looked rather grim. She never looked grim. She always had an angelic face, radiating love and kindness and peace - even when she was in pain, even when she was in sorrow, which was often, because for one thing, everybody else's sorrow was always her own. She never wore make-up, either, unless perhaps at a wedding, whereas the body was sporting pinkish lipstick. Then, home to have a nap and call my children to make sure they had gotten my messages yesterday that I wouldn't be coming for a visit this weekend after all. And I miss those grandchildren so much - AND their parents, of course! We are leaving for Greece in 3 weeks, and I have to find time to see them before then. Brief naps, then back to the funeral home for the Trisagion Prayers. The place was packed; standing room only. Everybody loved Ero. What was not to love? Even Jesus had enemies, but Ero didn't. Or if she ever did, nobody knows about it and that person must have been crazy. 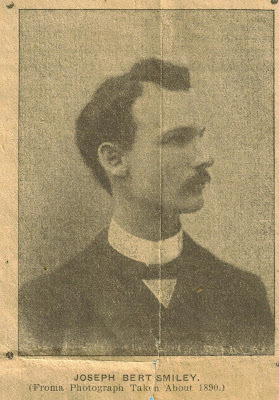 Matthew, her husband, looked tall and dignified and handsome. His godson is taking him away "for at least three weeks" to New York. They are planning some fishing trips. I'm SO glad, so relieved to hear this. It was terrible to imagine Matthew all alone in that big, now empty, house. Their four daughters and assorted grandchildren did them both credit. They got through this exactly the way their mother would want them to. There were pictures of Ero at various stages of her life. I always knew she was pretty, as are all her progeny, but now I see that as a young girl and then a bride, she was stunning. Gorgeous. After that, we went to supper at The Crazy Greek with another couple, because the man, Pavlos, wanted Demetrios to translate some medical documents for a friend of his. After we had finished eating, the men moved to another table to work; Ioanna and I passed the time talking. It was good company, but tiring, as the translating wasn't finished until ten o'clock. Now I'm off to bed, exhausted. Funeral tomorrow morning. 1Then He spoke a parable to them, that men always ought to pray and not lose heart, 2 saying: "There was in a certain city a judge who did not fear God nor regard man. 3 Now there was a widow in that city; and she came to him, saying, 'Get justice for me from my adversary.' [The King James Version hsays, " Avenge me of mine adversary."] 4 And he would not for a while; but afterward he said within himself, 'Though I do not fear God nor regard man, 5 yet because this widow troubles me I will avenge her, lest by her continual coming she weary me.'" Will the Lord really avenge you upon your enemies? Yes. Yes, He will, perhaps not now, perhaps not in this life. But He assuredly will. But we need to be very, very careful to give a Christian meaning to these words. Specifically, who is my enemy, if I am a Christian? And for what sort of vengeance am I to pray? St. Paul teaches us this: "For we wrestle not against flesh and blood, but against principalities, against powers, against the rulers of the darkness of this world, against spiritual wickedness in high [places]." (Ephesians 6:12) In other words, our true enemies are spiritual ones, demons, temptations, passions. As long as we understand that these are our only true enemies, then it matters much less what we think God's vengeance upon them will be. It's when it comes to human "enemies" we need to be far more cautious about what we mean by vengeance. 25 And behold, a certain lawyer stood up and tested Him, saying, "Teacher, what shall I do to inherit eternal life?" 26 He said to him, "What is written in the law? What is your reading of it?" 27 So he answered and said, "'You shall love the Lord your God with all your heart, with all your soul, with all your strength, and with all your mind,' and 'your neighbor as yourself.'" 28 And He said to him, "You have answered rightly; do this and you will live." Jesus replies to this legalist by telling a parable in which the neighbor is -- gasp! -- the worst of enemies, a Samaritan! In other words, we are to love not only our friends but also our "enemies" as ourselves. In other words, the Christian considers no one an enemy, but is good to all and prays for good things for all, and in this, becomes like his Heavenly Father. (Matthew 5:45-48). Yet there are indeed those who set themselves against us, who do us harm and injustice. It is perfectly Christian to pray that my name be cleared, that an unfairness be righted, that I be protected, that goodness prevail. In fact, all that sort of thing is comprehended in the Lord's Prayer, when we pray, "Thy kingdom come. Thy will be done in earth as it is in heaven." P.S.) It is equally unforgiving and wicked to take satisfaction in the idea that my neighbor has received punishment even vicariously; that is, in Christ's suffering and death upon the Cross. That is a hostile attitude, not a Christian one. I once asked somebody who had been very grievously wronged how she had managed to forgive the wrongdoer. Her reply, which startled me at the time, was, "I'm not sure I fully have." I have since learned what that means, and have found the remark very comforting. The point was and is to be always trying, always willing, always struggling to forgive. Fr. Stephen today blesses us with practical guidance in the matter of forgiveness, in his powerful post, "Forgiveness, the Hardest Love of All". Fr. Stephen helps us begin. Our dear Ero reposed in the Lord last night. A native of Berea (pronounced "VAIR-ee-ya"), she grew up amid war and insurrection, married young and came to America with her American-born Greek husband. He worked all his life at Kroger, bagging groceries and working in the stockroom. They have four daughters, each with variations of Ero's own pretty face, and many grandchildren; I don't know the exact number, but it must be a dozen or more. She is a sweet and gentle soul, kindness personified. Her life was a difficult one, but she lived it with courage and peace and great faith, keeping her sorrows between herself and her God, but spreading her joy. She was a behind-the-scenes peacemaker, too, always urging people to forgive and make up. She was an advocate for those who stood in need of forgiveness. To say, "Memory eternal!" seems to me almost blasphemous, as if anyone could doubt that she is now among the blessed; and nobody does. She has already been among the blessed for a long time. Yet, since to judge someone positively is as presumptuous as to judge her negatively, I say it anyway: May God remember her forever in His kingdom! ...but it's the principle of the thing. The can of food isn't cylindrical. I didn't realize this when I bought it, which of course is the idea. I didn't notice it when I put it away in the pantry, either. But yesterday, cleaning out the pantry, I noticed the bottom of the can was narrower around than the top. Isn't that a nasty little trick? To make it worse, the label on the can more or less tries to disguise the fact. You think, at first, this must be a weird optical effect of the label. But it isn't, and it isn't a distortion made by your eyeglasses, either. The bottom of the can really is narrower than the top. So when you buy it you have the impression you're getting more than you really are. You think you're buying the same amount you used to, for the same money. How much extra did it cost to have that non-cylindrical can manufactured, I wonder? Somebody went out of his way to deceive, and went to some extra expense, too. That's the kind of sneakiness I find annoying. Bernie Madoff was jailed today. He'll be imprisoned the rest of his life. The reporters I heard discussing it seemed disappointed that he pleaded guilty, as though they would rather have seen the man torn to shreds in a trial. What if he had been? What if he had even been sentenced to hard labor and then execution? What would have been accomplished? His victims' anger would have been somewhat more indulged. But what kind of recompense is that for his victims - momentary emotional gratification instead of financial reimbursement? Their life savings are still gone. They cannot now retire. They are looking at a lifetime sentence of their own: poverty. There are still charities that now cannot perform their services, because their money is gone. Is this justice? Well, it's as near to it as human systems can provide, probably. God's justice, though, is orders of magnitude greater than this, and why? Because He is able to do what our justice cannot, and that is to make the victims whole again. He really does, in the end, set everything to rights. He restores everything to the way it ought to be, was created to be. He makes everything perfect. What if Bernie Madoff's victims had everything made perfect again for them? What if they had all their money back, with all the appropriate interest and dividends? What if, besides that, their lives were made beautiful and perfect in every other way as well, so that they walked in peace, rejoiced in love, and gave incessant thanks to God? Then what would they want done with Bernie Madoff? Then it wouldn't matter nearly so much, would it? Because they would have their justice, true justice, in any case. God's justice doesn't require punishment (in the sense of getting even) for anybody. In fact, in God's justice, the optimum outcome is, Bernie Madoff repents and everybody forgives him (not necessarily in that order!) and we all live happily together forever after. Christ died for many reasons (which I discussed in a 19-part series of posts last summer) but not among these reasons is that God had some emotional or legal need to retaliate. He doesn't, because as Bernie Madoff clearly shows us, wrong cannot really be corrected by punishing the malefactor; wrong is corrected by being replaced with right. Yesterday we celebrated the end of the heresy of Iconoclasm. After centuries of controversy and debate, the Church put this bitter issue to rest, supposedly once and for all, declaring in Ecumenical Council that to kiss an icon or bow before it or carry it in procession is not worship. Not worship. NOT. And icons were to be restored, the official decree mandated, to churches lacking them. The Church resolved this question, folks, in the year 843! So why are some people still scandalized about kissing an icon, or bowing before it, or carrying it aloft in processions? Why is this controversy, this officially condemned heresy, still alive and well today? Are people ignorant of history? Or do they think they know better than an Ecumenical Council? What is it? 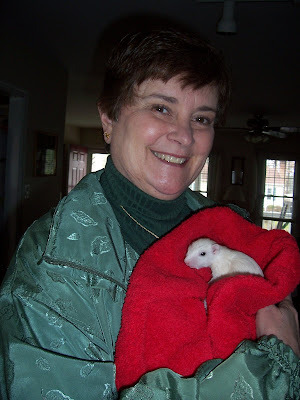 Our sweet, darling Ero (ee-ROH) is dying. Her family has gathered from as far away as California. The nurses are making her as comfortable as possible, which isn't very. Ero can hardly speak, but never utters a complaint. Of course, she has never been heard, ever, to complain about anything. Ero also could never bear to hear evil spoken about anyone. She would always get tears in her eyes and say, "Oh, please..." and jump to that person's defense. "Maybe she wasn't herself that day," or, "Maybe he didn't understand..."
Her husband, Matthew, 80, has frequently said he doesn't know how she has put up with him all these years. I don't know what he will do without her. I don't know how the world can spare her. Ero has well loved everybody, even those who constituted a test very few other people passed. 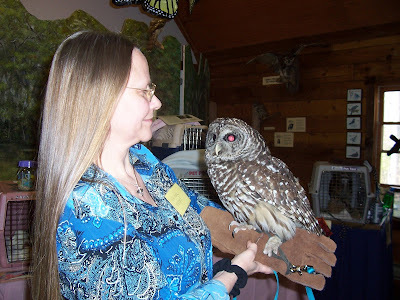 Ero has also prayed for my sister, Barbara, every day for years and years. It's so horrid to see her suffering this. This isn't Ero's first bout with cancer. But she recovered from her colon cancer. Seemingly, I suppose I should say now. I remember when she first came back to church after that, about 15 years ago; it was the Sunday of Orthodoxy, just as yesterday was, when many, many icons are carried around the church in procession, together with the Cross, and candles, and the Book of the Gospels. I was right in front of Ero, and everybody was kneeling, and as the Cross came by, I heard Ero whisper, "Eucharisto!" ("Thank You!") and I cried. 1. To mark your page you: use a bookmark, bend the page corner, leave the book open face down? I always use a bookmark. Years ago, I made several, by putting lengths of assorted ribbons inside sheet protectors. You place a dish towel over the sheet protector and iron it. The sides of the page protector then sort of meld together. Cut out the ribbons using a straight edge and a razor knife, and voila, bookmarks. 2. Do you lend your books? Never. I buy copies for people who may want to read them. 3. You find an interesting passage: you write in your book or NO WRITING IN BOOKS! I write in certain books, usually paperbacks, usually devotional or theological books. 4. Dust jackets - leave it on or take it off. I take it off while I'm reading the book. I wouldn't want the dust jacket to get scuffed up. 5. Hard cover, paperback, skip it and get the audio book? 6. Do you shelve your books by subject, author, or size and color of the book spines? Whatever arrangement fits on my limited shelf space. We have tons of book cases, but most of them are occupied by Demetrios' extensive library, and most of those are medical. Within space constraints, I group by subject. 7. Buy it or borrow it from the library later? Buy it. I've gotten out of that excellent habit of visiting libraries. 8. Do you put your name on your books - scribble your name in the cover, fancy bookplate, or stamp? What for? I already know the book is mine. My address book/day planner is the only book bearing my name, in case it should be lost. 9. Most of the books you own are rare and out of print books or recent publications? I have an Anglican/English Book of Common Prayer old enough to include prayers for Queen Victoria, and my Third Great-Grandmother's Gaelic Bible, and a couple of other antique books, but no more than half a dozen. 10. Page edges - deckled or straight? 11. How many books do you read at one time? 12. Be honest, ever tear a page from a book? Once. I carefully cut (did not tear!) a color plate of a wonderful icon of St. Demetrios from an illustrated book of icons. I had the St. Demetrios framed to give to my husband on his feast day. If you are reading this, you are TAGGED! 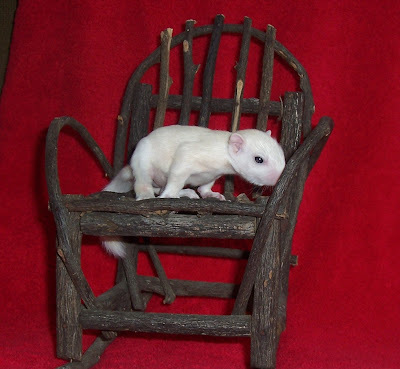 In The Story of Webster, by that incomparable humorist, P.G. Wodehouse, a young, bohemian painter inherits a black cat named Webster who sits around looking at him with such disapproval that the artist very nearly has to give up his dissolute lifestyle. Much to the alarm of his friends and fianceé, he starts shaving in the middle of the week, in fact, every morning, and wearing blue serge suits “with creases down the trouser-legs” and reading a book of etiquette. He gives up cigars and is very nearly at the point of having to give up drinking, too, being saved from this disaster only at the last moment when – well, you should read the story yourself. My point is, this young man was projecting his conscience onto Webster the cat. And that’s how we in the West tend to feel about our conscience, too. (Okay, I’m speaking for myself, but I say “we” supposing I’m not all that different from other folks.) We tend to feel as if our conscience were something dark and shadowy, always watching us. We can make it purr if we are very careful to keep doing everything as we ought. Otherwise, most of the time, the conscience is like that black cat, sitting there watching, staring, looking at us – with disapproval. Sometimes one even feels God is rather like that. He’s eyeing you with disapproval and waiting for you to do better. But no, no, no, a thousand times no! God is neither like some black panther prowling at your elbow nor like some dread reckoning you are eventually going to have to face, but you’d rather put it off as long as possible. That is not Who God is; that is Who our sins paint Him as in our minds, with the devil’s own paintbrush. You don’t have to kick yourself first to get to God. Repentance doesn’t mean feeling rotten about yourself; it means turning to embrace what, or rather, Who, is right there beside you, waiting for you, always open to you; namely, pure Love that holds no grudge, pure Goodness, Kindness, Understanding, Joy. The Christian God, in short, is like the father of the Prodigal Son. No, you don’t want to put off repentance, because our God is beautiful and is your freedom. Oh, and the reckoning, and the feeling rotten about yourself? That will come, but by the time it does, you won’t mind – far from it! – because you’ll be doing your weeping from your safe haven within the arms of your all-compassionate God. You’ll weep even as Hope swaddles you with Joy, and the tears will not be bitter, but somehow, miraculously, very sweet. Did you forget your pen, and now you need one, and a piece of paper to write somebody a note? Just ask Linda; she carries those in her handbag, along with some tape so you can leave the note on the door. Have you a headache? Linda carries both aspirin and acetomeniphen in her bag. Have you split your trousers, popped a button, or discovered your hem hanging down? Linda will hand you a small sewing kit, complete with scissors and thimble, needles and thread. Have you cut your finger, skinned your knee? Linda has bandaids in her purse, and antiseptic cream, too. Do you need change for a dollar, or for five dollars? Linda comes prepared to supply it to you. Whether it's a paper clip, measuring tape, rubber band, hand mirror, postage stamp, or safety pin, Linda carries it in her handbag, just for you, in case you may ever need it. Linda is a unique sort of a saint. 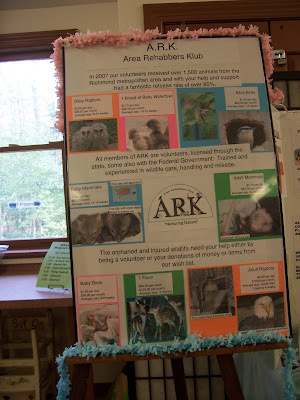 Our wildlife rehabilitators' organization, ARK, held its main fund-raiser today, the annual Wild Baby Shower. 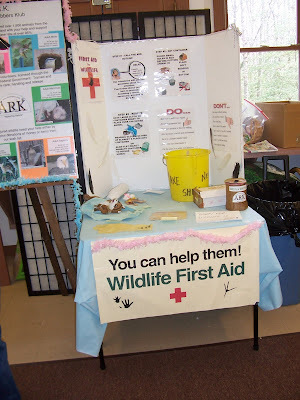 We took in approximately $1400, all of which will be needed, and more. 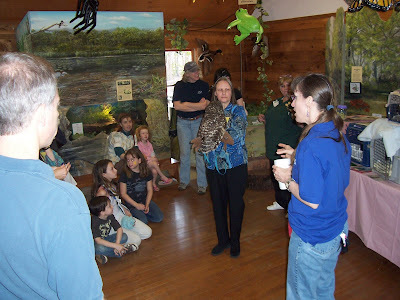 We had refreshments, door prizes, face painting for children, presentations featuring our education animals, in this case owls, oppossums, and squirrels. 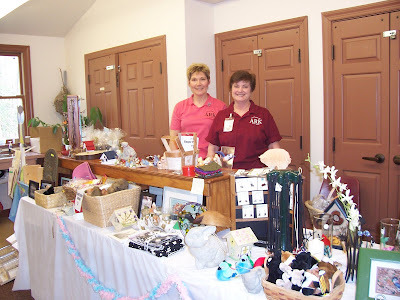 We had a silent auction, an information corner, a gift shop, a craft table. Goodie (left) and Angela work the "Gift Shop"
An "akathistos hymnos" is a hymn during which, for reverence, we do not sit down. On Friday nights in Lent, we gather and, in fulfillment of her prophecy, call the Mother of God blessed -- in scores of ways, no, hundreds of ways, as many ways as poetry can devise. Here are a few. Rejoice, thou who art the King's throne! Rejoice, thou who bearest Him Who bears all! Rejoice, thou through whom creation becomes new! Rejoice, thou through whom the Creator becomes a babe! Rejoice, initiate of God's ineffable will! Rejoice, prelude of Christ's miracles! Rejoice, bridge that conveys us from earth to heaven! Rejoice, scion of an undying Shoot! Rejoice, field of untainted fruit! Rejoice, thou who laborest for Him Whose labor is love! Rejoice, thou who givest birth to the Father of our life! Rejoice, thou who hast shown us Christ as the Lord and Lover of men! Rejoice, thou from whom flows milk and honey! Rejoice, tree of glorious fruit by which the faithful are nourished! Rejoice, bush of shady leaves by which many are sheltered! Rejoice, thou who bearest the Guide of those astray! Rejoice, thou who givest birth to the Redeemer of captives! Rejoice, all-holy chariot of Him Who rides on the Cherubim! Rejoice, thou through whom sin has been absolved! It was at a family gathering at the Outer Banks, going on ten years now. We sat around listening to some of Barbara's stories about being a veterinarian, and the various kinds of animals she had treated. We noticed she wasn't taking any wine. Wendy, I think it was, bought her a pregnancy test, more or less as a joke. Next morning, very early, we were all awakened by shouts and whoops of joy: "I'm pregnant, I'm pregnant!" We put Madison, then three, on the phone to relay the good news to her father. "Daddy," she said, "Mommy has a baby." There was a longish pause and then Madison turned to Barbara. "Daddy wants to know what kind of a baby." 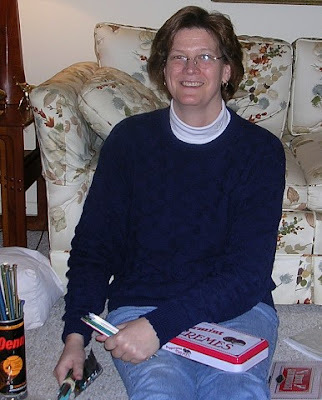 Today is the one-year anniversary of the death of my sister, Barbara. When we say, “Memory eternal!” we of course mean, “May God remember her forever in His kingdom.” But I have some different sorts of memories I am going to spend today pondering. I’m remembering our Great Needle Swap. We met for a weekend at Mom and Dad’s house and each brought all our knitting supplies, plus projects. Barbara and I sorted everything, made sure each of us, including Mom, had whatever needles and other supplies she wanted, and organized our knitting totes. And knitted, of course. It was such fun. I’m remembering the night I stayed up with her when she was in the Intensive Care Unit. I copied a Sudoku puzzle from a book onto the white board in front of her bed, and we worked it together. But I kept praying and one day she called me into her room and said, “Put your hand right here,” so I laid it on her “stomach” and felt something move. “What’s that?” I asked, startled. It was going to be a boy. His name was going to be Christopher Robin, as in Pooh’s friend. I said it was not a boy; it was my sister. Still, we didn’t have a girl name picked out. So when she was born, Mom named her after herself, Barbara. Can you imagine the effect all this had upon a (by then) ten-year-old soul? I remember the day I realized that what God had given to me, I must offer back to Him, with sorrow, yes, but still with gratitude, too, and faith that He knows and does best. And I shall always remember the grace and dignity with which she bore all her many sufferings, and I shall say to myself, if my baby sister could get through these, and do it so well, perhaps I can, too, because she has shown it to be doable. Do come with the angels to receive me, dear Barbara, when my turn comes! Please take a few moments to read Fr. Stephen and Vladimir Lossky on what faith is. Do this especially if you are not a believer. Do it also if for you faith is central to everything. It's too important a topic not to read this. Power is out in some neighborhoods, adding to the adventure, so I checked on my friends in those neighborhoods. Anita has a fire going, over which she cooked her lunch. She is all set up with battery powered table lights, radio, everything. She's wearing a fur coat for when she leaves the room where the fireplace is. Vada is wearing a pantsuit with her pajamas under them to keep warm, and two sweaters. Her nephew, a licensed electrician, is hooking up her generator for her, and her neighbors are keeping an eye out for her as well, so she will be okay. Today is totally white. 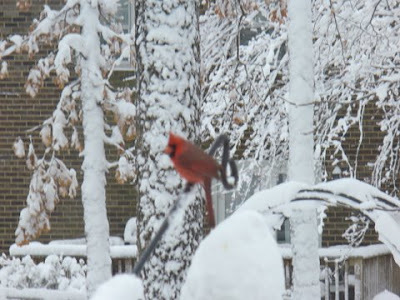 The snow began about 5:00 yesterday evening and just kept coming. When we woke up this morning, white was all we could see. The sky, the ground, the snow-filled air, the tree branches, everything white. Even vertical surfaces, such as tree trunks and fences, are coated in white. The white stuff on the ground is up to a foot deep. Now the sun is peeping out here ane there, adding sparkle. This is the first snow (to speak of) we've had in years. Nobody quite knows what to do with it. Last night, everybody left porch lights on until late, the better to see it. Last night, we all just huddled in our houses. This morning, very few people are out and about. 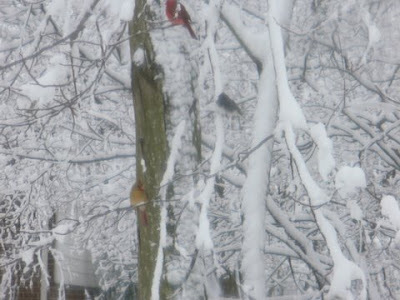 We had breakfast in the sunroom, surrounded by the falling snow and the white, swaying branches. Demetrios couldn't get his car door open, so after having spent 20 minutes digging out his car, he spent another half hour digging out mine. I hope he will arrive safely at work, and safely home again. The girls next door are out in their back yard, running through the snow, trying to get it to stick together to make snowballs, shrieking (which is half the fun). Their dog, Josie, an oversized Yellow Lab - Great Dane mix, is jumping with huge delight through the snow, carrying a snow-covered stick in her mouth that came down in the strong winds last night. No doubt scores of squirrel nests came down last night, too. But there's little chance many babies survived. 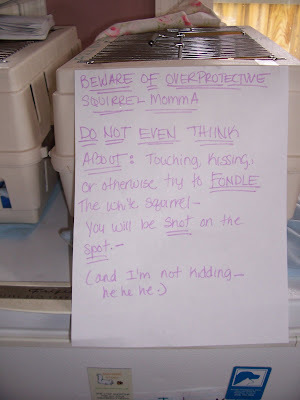 I'm glad all my squirrels (and I) are safe and warm. 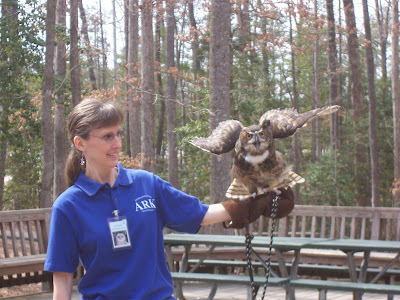 An apprentice wildlife rehabber named Caitlin is working with me now. She probably won't come today. I'll probably miss my doctor appointment, too. I think I'll spend whatever free time I have today in the sun room. I'll bring my laptop there, fold laundry there, knit in there, read in there, whatever. UPDATE: 12:40 p.m. I can't believe it! The snow is still coming down, fast and furious. The good part is, two volunteers have been by twice now on tractors with snowplows. People who absolutely need to get out can. Please forgive me all the offenses I have committed in the last year against you, the times I've been too strident, too flippant, too pesky, etc. etc. etc. Please know it was unintentional and I shall strive to be more careful, as well as kinder and more considerate.